Vlado in the zone, at the post-show party. A lively, fantastic post-performance and post-tour party at the newly opened Eksperiment restaurant. Vlado and Seth entertained much to the delight of all who attended, which included a content Gigante cast and crew, the US Ambassador, Embassy employees, local actors and dancers, Ulay, and friends and family. Thank you all who made this fantastic tour possible! Hvala lepa! After the performance, the cast and crew met the US Ambassador and audience members in the theater lobby. The Ambassador was very pleased. 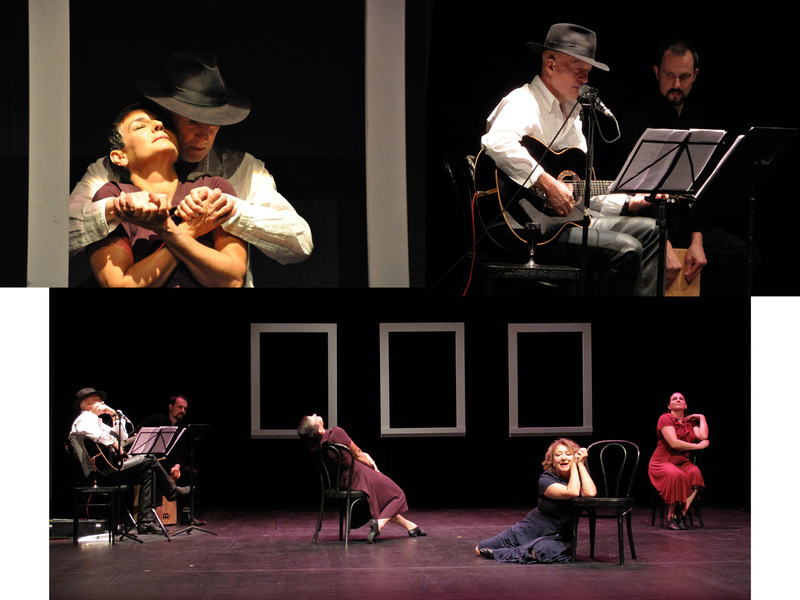 Check out the US Embassy’s description of the performance and their photo album. After performing in Koper on the Adriatic, the company moved on to Slovenia’s capital city of Ljubljana. 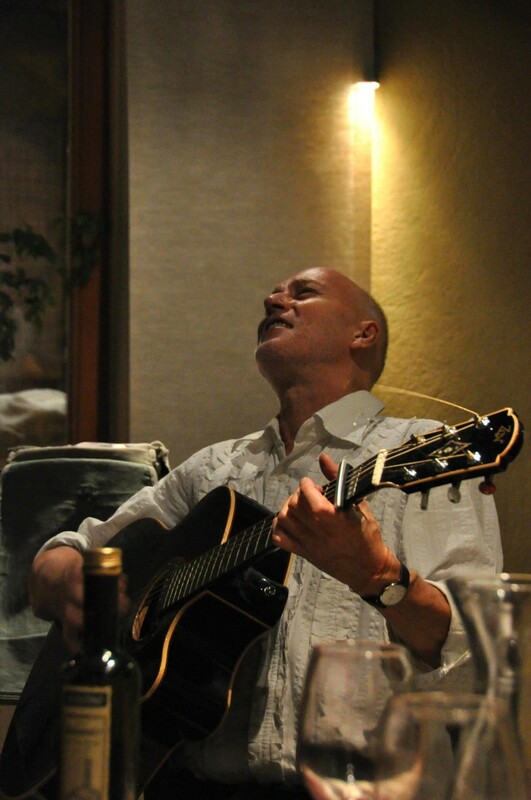 It was a fantastic evening. 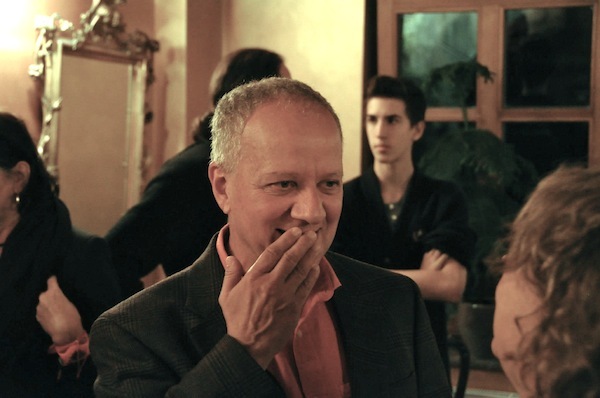 Prior to the performance the RTV television crew interviewed Vlado Kreslin and Isabelle, and filmed an excerpt from the piece, which was shown on the cultural news that evening. (scroll to 4:09). The performance was magical, the Mini Teater packed. In attendance was the US Ambassador, Joseph Mussomeli, his assistant Mateja Jurič, performance artist Ulay (former partner of Marina Abramovič), author Noah Charney, numerous actors and dancers, Simone’s family from Udine, Italy, and friends and family of Isabelle and Mark. It was truly exciting. True to Slovenian audiences, the dancers received a warm reception, and took bow after bow after bow. Murska Sobota, in the region of Prekmurje (where Vlado Kreslin is from) was fantastic. The performers visited Vlado’s weekend home, while the production crew slaved away in the theater hanging and focusing lights. When the performers arrived at the theater, they were greeted with a huge Three Other Sisters poster hanging at the front of the theater. The theater inside is lovely, the stage spacious. The performance that evening was charged, and the audience reacted with great enthusiastic applause, cheers, and “bravos.” Gigante was treated to drinks in the theater lobby afterwards, and later, moved on to an authentic Prekmurian dinner at a local restaurant. Beautiful historic Ptuj, the oldest city in Slovenia. The performance in Ptuj went very well. The theater, newly renovated, is charming. The audience was extremely warm and receptive, and the performers once again received flowers on stage. 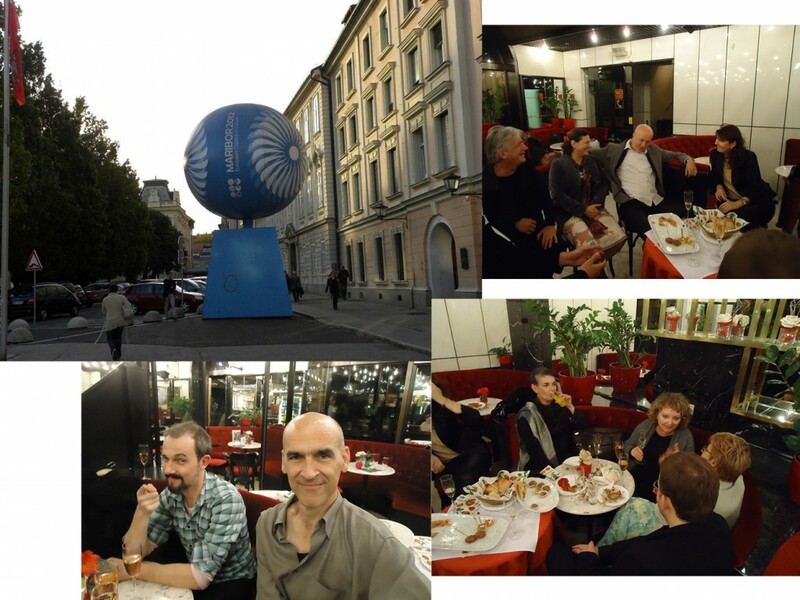 The hotel was fantastic, artsy and luxurious, and we were able to relax in a private spa after the show and the next morning, before leaving for Murska Sobota. Scenes from the opening in Maribor. 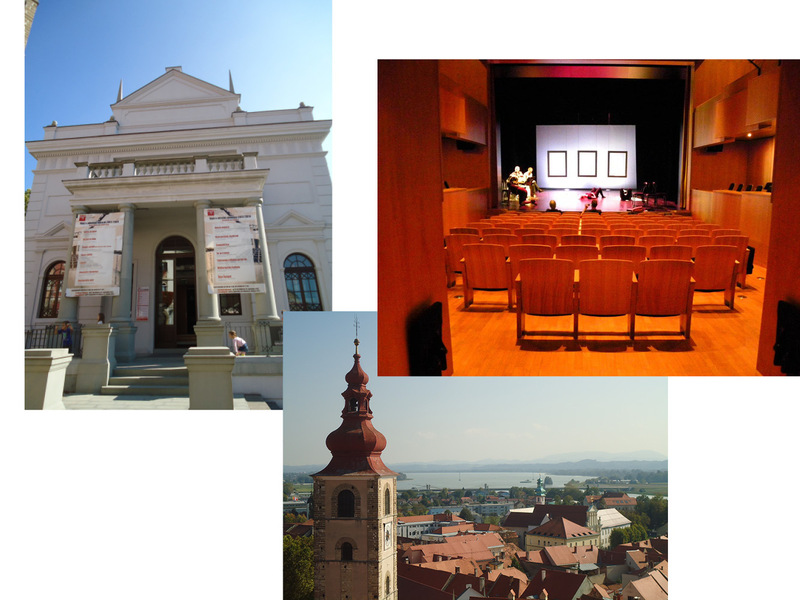 Maribor has been chosen the European Capital of Culture for 2012, and it is here that we opened with Three Other Sisters. 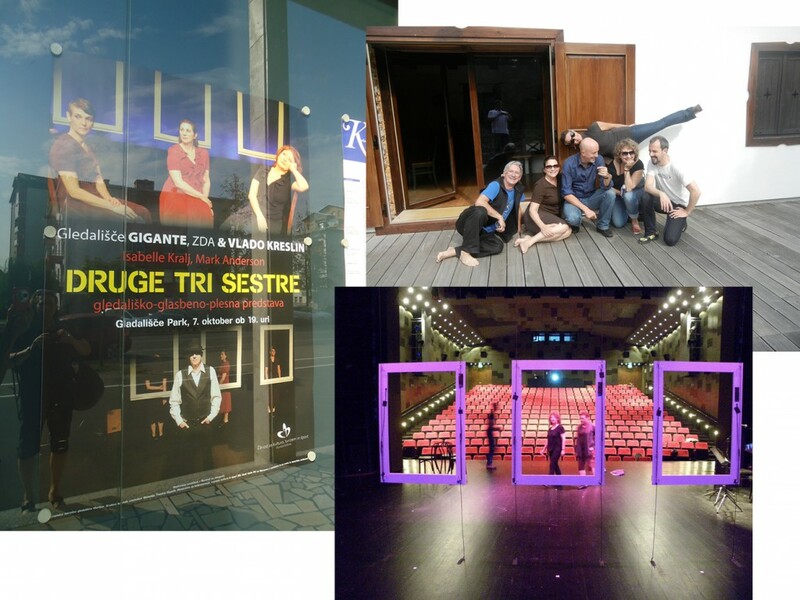 Performing in the Slovenian National Theater of Maribor, Theatre Gigante got a taste of the warmth and appreciation of Slovenian audiences…great applause, 24 bows and flowers received on stage…a wonderful beginning to the five city tour. After the performance the company was treated to a lovely reception, hosted by the Maribor Theater, with Fabulous Slovenian sparkling wine, hors d’oeuvres, and lovely conversation: a delightful cultural interchange! Maribor theater, with the bust of Isabelle's lauded aunt, actress Elvira Kralj. 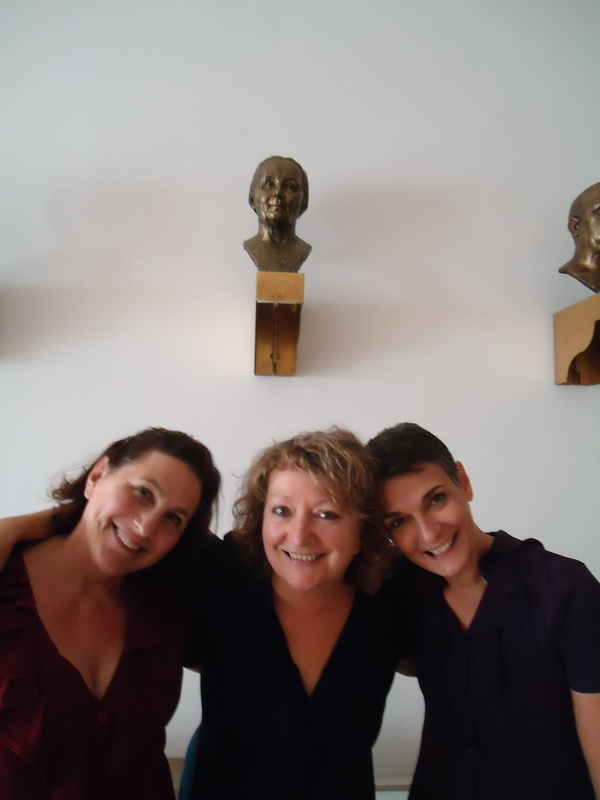 After the dress rehearsal in Maribor the Three Sisters (Janet Lilly, Isabelle Kralj, Simone Ferro) paused under the bust of Isabelle’s famous aunt – award winning actress Elvira Kralj – in the lobby of the Slovenian National Theater of Maribor. In a few hours, the ladies will grace the stage in the opening performance! 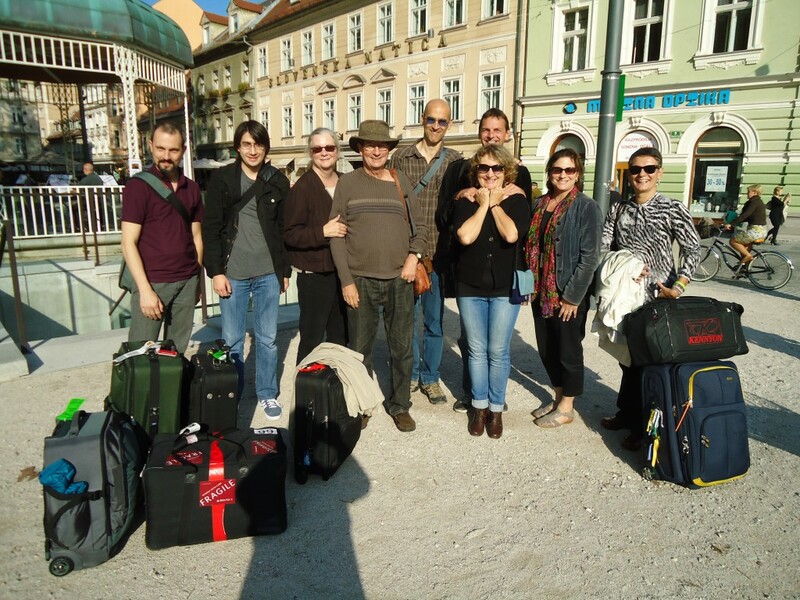 Beautiful sunny day in Ljubljana as the Three Other Sisters cast and crew stop for a photo in Ljubljana’s city center after arriving in Slovenia!